In June 2019, I’m teaming up with local guide Richard Hartley to offer a guided photography trip across the highest and most remote mountains of the Spanish Sierra Nevada. The Sierra Nevada offers a wealth of untapped photography potential. This is wild mountain country, with few visitors and fewer footpaths, and lots of wildlife. We’ll photograph snow tunnels, alpine lakes and meadows, ruined mountain refuges and the views from many of the 30 mountains over 3000ms. Our plans include a sunset visit to the most dramatic summit of the entire range, and a north face traverse of the highest mountain in mainland Spain. This UNESCO Biosphere reserve is rich in flora and fauna including Bee-eater, Eagle and Griffin Vulture, Ibex, and many endemic plants and insects. Our itinerary is physically challenging but entirely non-technical, and most important - well off the beaten track. We’ll be camping in tents along the way, giving us the chance to photograph at dawn and dusk when the light is at its best. Imagine the shattered grandeur of the Alps… more desert-like and more deserted, and without the commercialisation… or the rough boulder strewn ridges and plateaus of the Carn Mòr Dearg Arete in Scotland or the Glyderau in Wales… but without the visitor numbers that such places generate in the UK. Sahara hued sunsets and silent mountain corries surrounded by spires of mica and quartz, no roads, no light pollution and a profound sense of space. You will come back with original images having had a real adventure in genuinely unspoilt mountain terrain. 8th - 15th June, 2019, a six day trek with two days travel. Day 1: Arrive at Malaga and transfer to our hotel in Lanjaron for dinner and introductions. Day 2: Vehicle transfer to the start of the trek, through the Berber hill villages of the Alpujarra. We’ll walk up the beautiful Trevelez valley to camp beneath the first 3000m peaks. Day 3: A day of dramatic ridge walking and easy scrambling between crumbling towers and above picturesque lakes. A night photography session at our lakeside camp. Day 4: A more relaxed start, walking through alpine meadows alongside streams and waterfalls. Sunset photography from the summit of Alcazaba, perhaps the finest of Sierra Nevada’s ‘Tres Picos’. 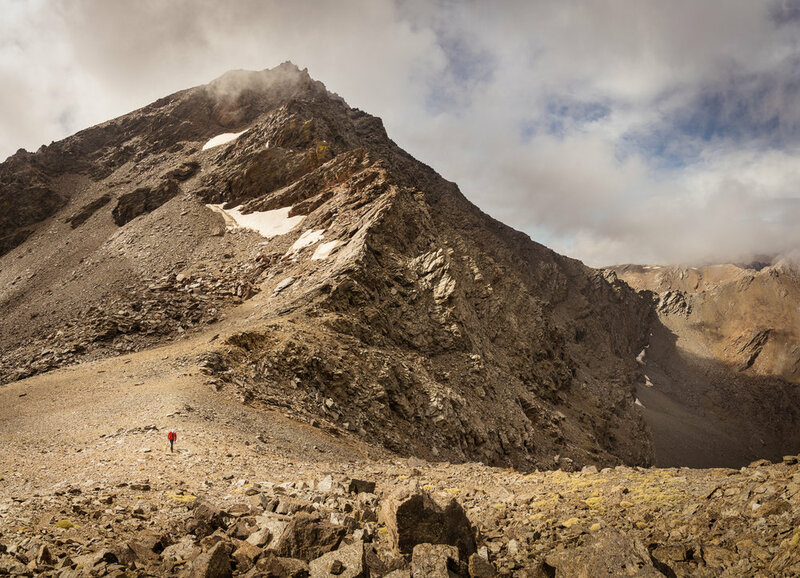 Day 5: A dramatic north face traverse of mainland Spain’s highest mountain, before summiting Mulhacen itself. Evening camp is perfectly situated for both evening and morning light at the source of a major river. Day 6: We’ll continue from one river system to another via a high pass and a valley floor, photographing snow tunnels and an abandoned refuge along the way. Another perfect alpine campsite awaits. Day 7: Flanked by jagged spires and vast piles of slate, we’ll descend to waiting vehicles and back to Lanjaron. Optional photo sharing/Lightroom session before a celebratory dinner at the hotel. Day 8: Transfers back to Malaga and flights home. I'm able to keep costs low by working with a local guide and visiting an area off the circuit. More original photos, more money in the hill community we visit, and more value for everyone on the trip. · 6 days trek in a small group (minimum 4, maximum 6), plus 2 guides. · Transfers to and from Malaga airport. · 2 nights in a historic hotel (at the start and finish - sharing, but a comfortable place with a good restaurant). · Transport to the start and from the finish in the foothills. · An (optional) photo sharing/Adobe Lightroom session on the last night. · Flights to and from Malaga airport. Our small group and relaxed itinerary mean plenty of time for individual coaching as well as more structured group photography sessions. I completed a full traverse of the range in 2018 and have been visiting the area for over a decade. Our guide Richard Hartley moved to the Sierra Nevada mountains in 2002, after many seasons in the Alps. He is the owner of the tour and guiding company Spanish Highs, and runs walking, trekking, mountaineering, snowshoeing and ski touring trips into the mountains from his base in Lanjaron. He also leads regular expeditions to the Southern Patagonian Icecap and is the author of the recent Cicerone Guidebook “Walking and Trekking in the Sierra Nevada”. This is an alpine trek, and a good level of hill fitness is needed, as well as a reasonable head for heights. Our route may be strenuous but is entirely non-technical, so you won’t need any scrambling or climbing experience. Some backpacking equipment can be provided - Tents free of charge, stoves and gas canisters for a small fee. There’s also the opportunity to share or loan some other kit, including camera accessories. A full kit list and guidance will be supplied upon booking. … and any questions about the trip, don’t hesitate to get in touch.